Normally posts made by the Sheriff’s Office are pretty formal; we aim to get the facts out without putting in our individual opinions. This post is a little different. On December 11, the Sheriff’s Office held the annual “Shop with a Sheriff” program. The Sheriff’s Office partners with the community and local business to try to spread joy to local children whose families need a little extra help this holiday season. Each year the Sheriff’s Office works with local resources to identify children to go shopping with a deputy so that the child may purchase clothing, toys, and even gifts for family members. This year, as in years past, DFC Corey McCarthy volunteered to be one of the “shopping deputies”. Corey was paired with a very sweet little girl named Madison. As they began their shopping adventure, Madison let Corey know that she really was hoping to find a panda shirt; Madison is pretty fond of pandas. They searched the store high and low, but were unable to find a panda shirt. Now, Madison was able to leave the shopping event with some pretty awesome gifts, but just not the panda shirt. 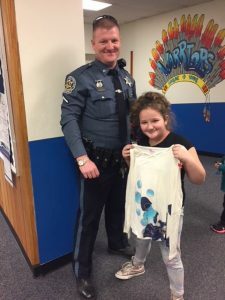 Wanting to bring a little more happiness to this sweet little girl, Corey took it upon himself to find a panda shirt for Madison. Yesterday, Corey made a special lunch time trip to visit Madison at school and give her the panda shirt he found. A little birdy who witnessed the exchange, said “Her eyes lit up when she saw him, she got the biggest smile on her face”. This is what the Holiday Season is all about. I am beyond proud to say that I have co-workers such as DFC Corey McCarthy. Stay safe and have a Merry Christmas!